The helmet may be the most important piece of equipment a football player dons before practice or a game. Protecting the head from violent collision or cushioning it from contacting the ground when tackled is paramount in reducing or preventing skull, brain or facial injuries. The best helmets on the market safeguard players against the risk of concussion from the most brutal hits. 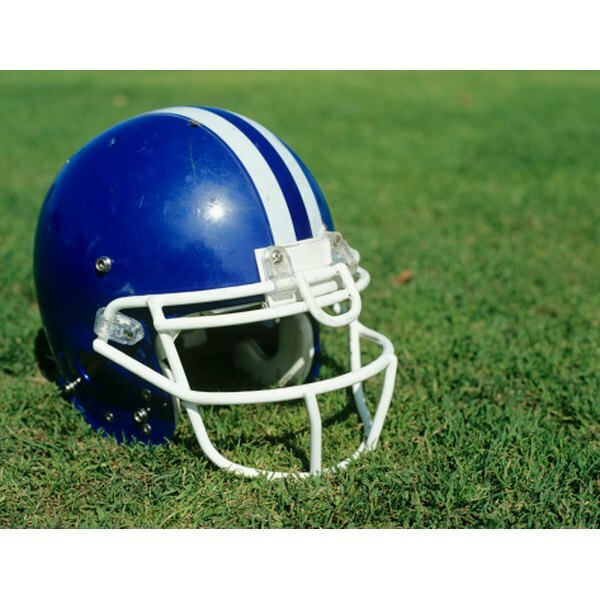 The National Operating Committee on Standards for Athletic Equipment certifies helmets for safety and performance through drop tests in varying temperatures and from varying heights. According to the standards, "Any structural changes or other changes that take place during impact testing which result in un-restorable, loosening of the fit shall be cause for failure," as with any helmets that score higher than 1,200 on the severity index established by NOCSAE. The Xenith X1 is a next-generation concussion-prevention technology. Released in fall 2008, the X1 has an air-cushioned interior with 18 inflatable discs. According to an article in "Wired" magazine, the discs "pancake" on contact to absorb energy from a hit and re-inflate to move with the head. A built-in drawstring tightens the helmet's bonnet for a snug fit. Four Riddell helmets offer the company's concussion-reducing technology. Its Revolution Concussion Reduction Technology was tested as part of a three-year trial by the University of Pittsburgh Medical Center. The study, published in the journal "Neurosurgery" and featured on the Riddell website, showed that a player's risk of concussion was reduced by 31 percent. The base Revolution helmet contains the Z-Pad energy dispersal system, carrying force away from the skull. The Revolution IQ contains the Z-Pad and a face mask that can be detached by the push of a button, allowing medical personnel easy access to the face and head. The Riddell Revolution Speed takes the features of the Revolution IQ and adds an air cushion to the interior of the helmet. Padding in the back and crown and on the side of the Revolution IQ flattens on contact and inflates to deflect concussive force away from the skull. The helmet also has a removable liner with moisture-wicking material to keep the head cool and dry. The Revolution IQ HITS takes the benefits of the IQ helmet and adds a technological feature to protect players. HITS, or Head Impact Telemetry System, transmits data from sensors throughout the helmet to sideline computers, measuring the intensity of each impact. Schutt Sports is a leading youth football helmet manufacturer. It has reached into the varsity and adult markets with the ION 4D, which tops the 2010 football helmet ratings at sporting goods reviewer HRS Informer. According to Schutt, its trademark thermoplastic urethane, or TPU, cushioning system deflects energy from hits to the head, while wicking away sweat and preventing bacteria buildup. The DNA also contains TPU Cushioning and a secure face mask removal system. When treating an injured athlete, trainers can remove DNA's face mask with the quarter-turn of a wrench. Schutt's Air XP helmet employs TPU Cushioning and the quarter-turn face mask release, as well as a lighter face mask. Made from titanium, the mask is stronger and lighter than traditional steel. Rawlings released its next-generation football helmets in 2009. It manufactures two helmets in its NRG--Neuro-Responsive Gear line. The Quantum incorporates the company's Active Impact Absorption system, an air-cushioning system, along with thermoplastic urethane padding to reduce jarring and concussion risk. The NRG Momentum is the youth version of the Quantum.